The Western crowned pigeon or, more generally, Common crowned pigeon or Blue-crowned pigeon (Goura cristata Pallas, 1764) belongs to the order of the Columbiformes and to the family of the Columbidae. Definitely, the most appropriate description to describe these strange birds, three different species united in the genus Goura, was given by Figuier in his book about the avifauna dated mid-nineteenth century, when he placed them in a family he commonly called, of the hen pigeons. However, at that time the last one of the three presently known species had not yet been classified. To tell the truth, also the species taken as reference by the French naturalist was christened and called Crowned lophophorus, term used much later to give the name to the genus Lophophorus, group gathering absolutely different species of birds as three wonderful phasianids indigenous to the Asian mountainous chains that have on the head, rightly following the Greek etymology of the scientific name, a tuft or a crest. In any case, it is the first impression that counts and to define at first sight this bird as a real pigeon is quite hazarded seen its particular morphological characteristics. A behavior and size of a hen that during the day spends its time scratching the ground between the shrubs of a dense swampy forest and the night among the branches of the trees like a real pigeon. 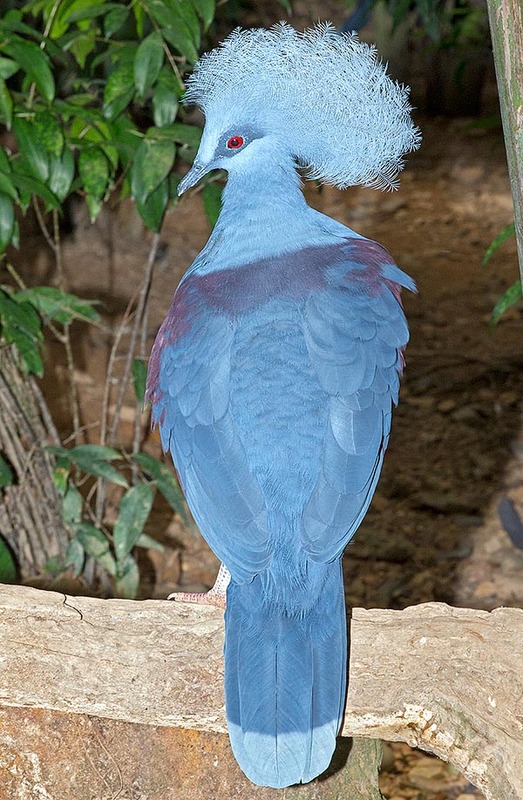 The Western crowned pigeon is a typical bird of that part of the world, the New Guinea, that even now hides very particular species and perhaps still to be classified, an area already defined by A. Russell Wallace like a place where mammals and birds got characteristics different from those on this side of an imaginary line marking its boundary: the Wallace Line. This bird, even if confined in a restricted area and little prolific, was very common in the territories occupied and has been object during the last century of consistent seizures of specimens for furnishing parks and zoological gardens of the whole world. Also the breeders are interested in this bird due to the facility of detention: in fact, it has a very pacific character and adapts easily to the captivity. The long and secular presence of the Dutch in that area, gave Pallas the possibility to study the fauna coming from those remote locations and that was kept in his country, in small collections and private museums of the time. It was in this way that during his stay at The Hague, he was able to classify new species among which this nice crowned pigeon that till then had remained nameless. The etymology of the scientific binomen gets origin for the genus, from the local name given in Papuasia to this bird “Guria” or “Gura”, whilst for the species from the Latin “cristatus”, rightly provided of crest, of feathers on the head. Other international names are: in Italian, Gura occidentale; in English, Western Crowned Pigeon; in German, Krontaube; in Spanish, Gura Occidental; in French, Goura couronné and in Portuguese, Pomba Goura. 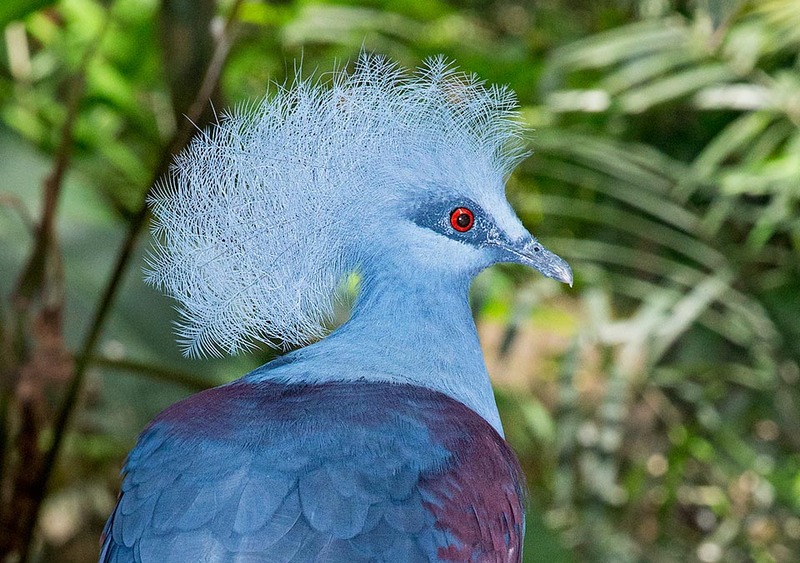 The western crowned pigeon lives in Irian Jaya, in the extreme western part of the immense and wild New Guinea and in some neighbouring islands, extreme eastern point of the Indonesian Archipelago of the Moluccas. It is found in Waigeo, Misool and south up to Seram, here possibly introduced in old times, in the multitude of more or less vast islands going from the Vogelkop Peninsula in Irian Jaya, westwards. It is a species endemic to these places and does not overlap in any part of the range with the congeners. The territory is only partially, but neatly and distinctly, bordering with that of the other two species, the Southern crowned pigeon (Goura scheepmakeri Finsch, 1876) relegated in the southern territories of New Guinea and the splendid Victoria crowned pigeon (Goura victoria Fraser, 1844) typical to the north-eastern part of this island. The western crowned pigeon is a purely columbid of the plain that frequents the coastal rainforests, the swampy areas with thick vegetation of mangroves, of arboreal ferns and impenetrable underwood. Being strictly linked with humid environments, with soft and muddy ground, at times even partially flooded, finds when on the groung what is necessary for its subsistence, rummaging among the rotting material accumulated on the ground. As we have mentioned before, this crowned pigeon spends most of the day on the ground, hidden into the thick vegetation and well camouflaged by the perennial shade typical of the low layers ot the pluvial forests. Only when darkness falls, in order to avoid possible terrestrial predators, it becomes arboricolous and shelters on the highest branches of the trees to spend there the night. The fact that it has been classified among the columbids does not mean that this bird must be absolutely similar to the members of this group. Its measures are exceptional for being a pigeon. It can be 75 cm long, have a weight of 2400 g and a wingspan of 80 cm. Furthermore, if we consider that the plumage is very fluffy with soft and voluminous feathers, that has a well developped tail and that on the head it has an immense tuft made of fringed feathers like a pompom, we can well say that it has the size of a female turkey or, even more, of a big hen. The basic colour of the livery of the western crowned pigeon is the bluish ash grey, diffused on all the plumage with various intensities. The body, in the lower part as well as in the upper one, the neck, the head and the tail, have a solid and compact colour with an attenuated tonality very similar in the colour to the indigo, excepting the terminal part of the tail feathers forming a paler band, almost whitish. The shoulders and in general the alar coverts are of a stronger bluish, tending to violaceous brown that form a sort of a dark shawl, contrasting with the rest of the plumage. Some lined feathers of the secondary coverts are very white and create a short alar spot well visible on the body. On the face, in correspondence of the eye, is present a small oval dark mask, of the same colour as the coverts, that emphasizes the eyes that are of a glittering carmine red colour. The bill, typical as a pigeon, even if more massive, is also light blue, whilst the legs are greyish with reddish fingers. The most particular part of the plumage of this bird is the tuft or at least the pompous and fluffy series of very flexible and waving feathers, placed on the head like a crest that from the front goes up to the occipital zone and looks more like the crest of a helmet of a medieval knight than a real tuft. Feathers about 10 cm long, more white ashy than the overall livery, formed by elongated and sparse barbs, similar to those of an ostrich, as render them transparent, soft and impalpable. 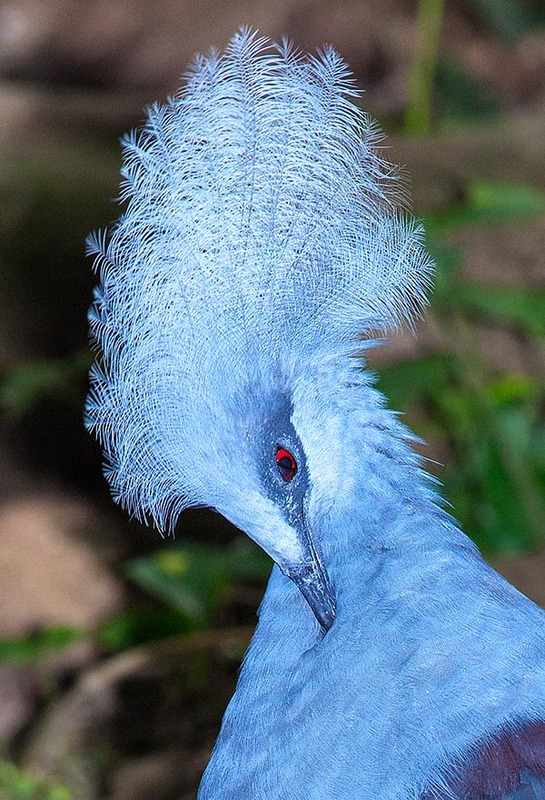 These feathers, of uniform colour in this species, differentiate from those of the Victoria crowned pigeon that has them spotted white in the terminal part but are instead quite similar to those of the southern crowned pigeon. The sexes are identical even if at times the male is a little bigger but however it is quite difficult, also for the breeders themselves to determine the gender with certainty. This is a quite sensitive issue, and also in the commercial exchanges among breeders, the probability of being sure to purchase a couple is somewhat problematic. The young display at once a livery very similar to the adults even if they do not evidence the white of the alar bar that is darker and a less fluffy tuft. The sexual maturity is reached on the second year of age. Up to the present, there are two recognized subspecies for this columbid, the Goura cristata cristata of the dry land of Irian Jaya and the Goura cristata minor of the islands to the west. A third one, the Goura cristata pygmaea present in the island of Misool is not yet officially accepted by all. The nest is placed on top of palms or on high arboreal ferns but also on the highest branches of the mangroves, at a height of several metres from the soil. A robust and voluminous platform, built with increasingly tiny sprigs to form an open cup covered by dry leaves and small grasses, where will be laid the usual only egg of white colour. Occasionally they may be even two or exceptionally three when in captivity, but the species is in any case poorly prolific, maintaining the average number per brood inferior to the two eggs typical of the columbids. The brooding lasts 4 weeks and the chick remains in the nest for a period of 35 days more. Like all columbids, during the first weeks of life the nestling is nourished with the particular “pigeon milk”, secretion poured out by the parents directly into the throat of the chick, formed by predigested seeds and vegetables. The difficulty in being able to imitate this type of feeding, is one of the main problems of the breeders who, though having available incubators for the eggs hatching, are not able to feed the chicks in this delicate period. The young remains in the family group for long time even after the complete autonomy. The western crowned pigeon is a bird partially social out of the nesting period and can gather in small groups of a few specimens while looking for food. The feeding is purely vegetal with seeds and fruits fallen on the ground but also arthropods and mollusks it finds while scratching the ground. Like all pigeons also this species emits a particular and boring sing but instead of being the usual cooing well known to us, repeats a gloomy and mournful “uum uum” more similar to the sound of a dull drum than to a real song. 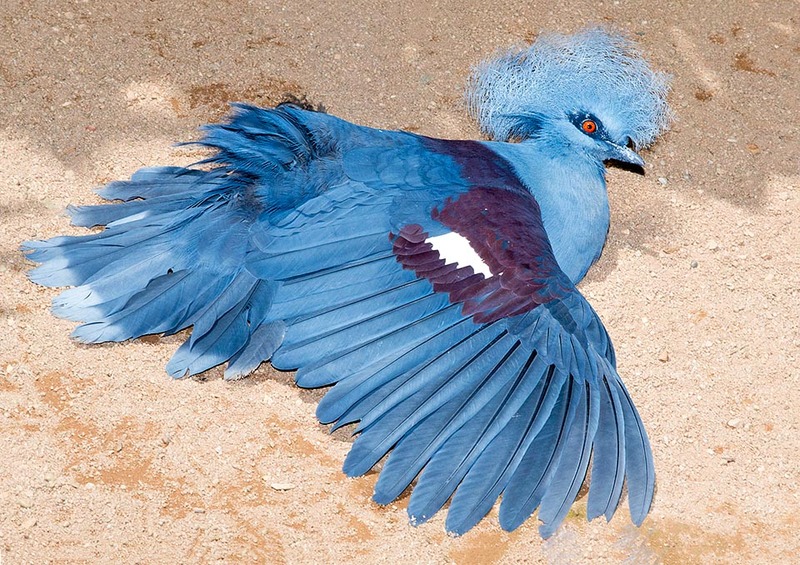 The western crowned pigeons are considered as an excellent game and they are coveted preys for the local populations so much that in some areas they are in dramatic reduction and at times close to a real and total eradication. Having limited and delicate limits such as small islands, in these locations they are strongly menaced and easy to find, in particular with the modern hunting instruments that are quite different from the archaic bows, arrows and blowpipes used in the old times. To this has added a thriving illegal trade that sees the catching and the exporting of a very high number of specimens towards nearby nations for feeding purposes as well as for breeding. Also the feathers are locally demanded for their softness and fluffiness. 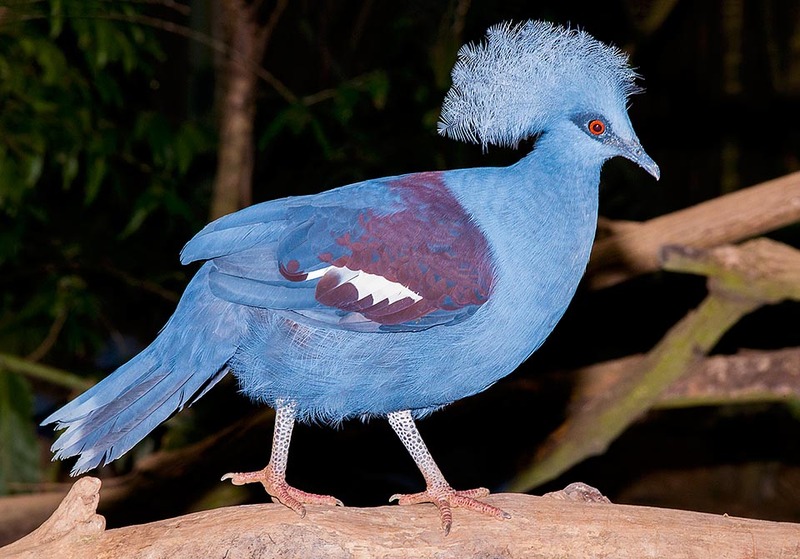 For these reasons and due to the limited occupied territory, all three crowned pigeons are considered as vulnerable species and inserted in the Appendix II of CITES. 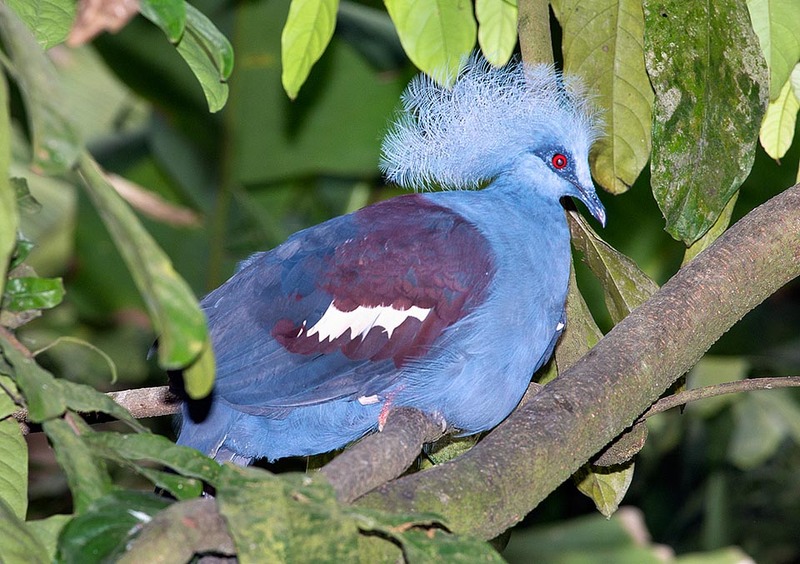 The western crowned pigeon is reproduced on the emblem of the autonomists of the Republic of West Papua as national bird of this western part of New Guinea.